I was given a requirement for a single use USB drive that can be used to update the firmware of a single machine then would disable to limit the distribution of the file. The drive should also be not readable on desktop computers. Not being being able to find a single use USB drive a manufacturer in China able to offer me drives with SDK I decided I would make it myself. 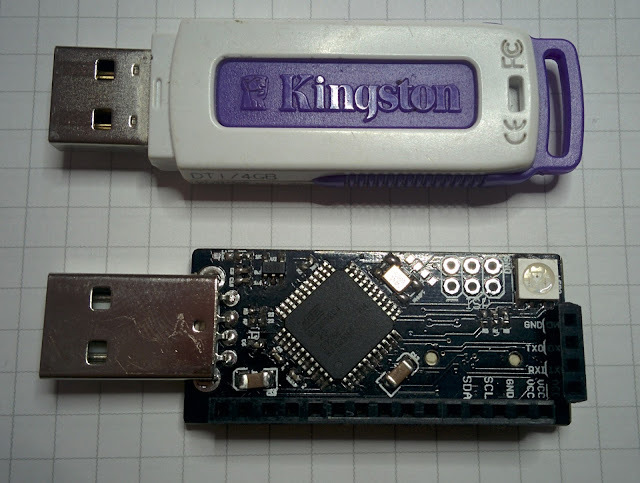 The drive is based around the ATmega32u4 running LUFA, now the USB on the 32u4 is not the fastest but as I only need to deliver a 1MB file it does not need to be the fastest so a 32u4 is one of the simplest processors I could get away with. The drive will disable once the firmware file has been completely read by the target machine. There is also logic to disable the drive if any other files are read, this means if the drive is connected to a PC or MAC and it tries to read autorun.inf or any thumbnails the drive will instantly disable reading of the drive. The unit can also act as a Arduino with the right bootloader installed and with a SDcard socket onboard could be useful as generic USB powered datalogger.